It’s four years since Britain, and many other countries, closed their embassies in Damascus, Syria, and withdrew their diplomatic staff, the famous city having become too dangerous to live in or to visit. Before then, though, it had an exotic appeal to Westerners, especially Peter Clark, who fell in love with the place in the 1960s and then returned in the 1990s to run the British Council branch there. His diaries of that time have just been published by the specialist Middle East publisher, Gilgamesh. They paint, Gilgamesh says, ‘a vivid and almost nostalgic picture of life in this remarkable city’. I, too, have visited Damascus, in the mid-1970s, staying just a couple of days as I hitchhiked my way from Europe to Australia. As my own diary entries remind me, I found the Syrians most friendly and hospitable. Peter Clark was schooled in Loughborough and Southend before studying at Keele, Cambridge and Leicester universities. He joined the British Council in 1967, mostly working abroad, in the Middle East and Africa, remaining with the institution for 30 years or so. In 1992, he was invited to reopen the British Council office in Syria, a country he’d first visited in 1962, and he remained until 1997. He enjoyed good relations with the British diplomatic staff, and, briefly, met successive foreign ministers, Douglas Hurd and Malcolm Rifkind, on their official visits to Damascus. Among Clark’s cultural successes were a production of Purcell’s opera Dido and Aeneas in Arabic and an exhibition of Freya Stark’s Syria photographs. After retiring from the Council, he returned to Syria occasionally leading lead tour groups. Clark is fluent in Arabic, and has translated novels, drama, poetry and history by contemporary Arab writers. He has written books on the Islamic scholar Marmaduke Pickthall and the explorer Wilfred Thesiger, and published a collection of writings on the Middle East - Coffeehouse Footnotes - as well as a book on Istanbul. He is a trustee of the International Prize for Arabic Fiction, a contributing editor of Banipal, and an adviser on cultural tourism to Turkey and Syria. He is married, and lives in Frome Somerset. A little further biographical information is available from Debretts, The International Prize for Arabic Fiction, the Gilmour Print Service or a Marmaduke Pickthall fansite. Throughout most of his adult life, Clark has kept personal diaries, and his time in Damascus was no exception. Perhaps because of the troubles now afflicting Syria and its capital, Gilgamesh - a specialist in Middle East books - has chosen to publish Clark’s diaries of his Damascus years. 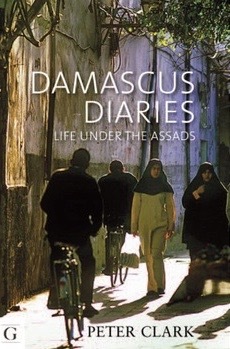 It says of the book - Damascus Diaries: Life Under the Assads - ‘Here we see the dramas and routines of everyday life played out against the backdrop of the world’s oldest continually inhabited city on the eve of collapse into civil war. Enchanting and alarming by turns, everyday events combine to paint a vivid and almost nostalgic picture of life in this remarkable city.’ Reviews can be read online at The Economist and The Tanjara. Here are several extracts (with thanks to Gilgamesh Publushing). ‘I am at the office early and at precisely 9.30 we hear the screaming of sirens, and Douglas Hurd, his detective, and the Ambassador arrive, followed by members of his entourage - Richard Culshaw in charge of the press and his Principal Private Secretary, John Sawers, whom I last saw in Yemen in 1980. 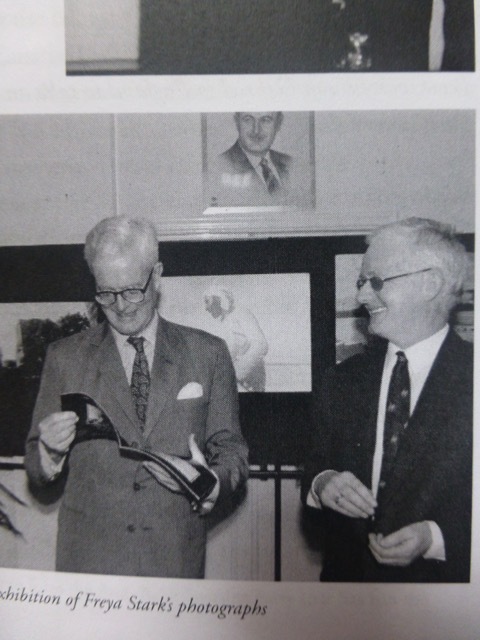 I take Douglas Hurd round the exhibition of Freya Stark’s photographs, and he talks to some of the staff. He also signs my copy of his novel, The Palace of Enchantments, which was already signed by the co-author, Stephen Lamport, in Abu Dhabi. And that is that. The party disappears and so do we. ‘In the afternoon we go for a walk, due north, beyond Muhajirin and up the mountain. Jabal Kasiyun has slowly had the city encroaching upon it. We climb up roads that are at a gradient of about 1 in 3. The views over the city get more and more splendid - skyscrapers stand out, tall white buildings, with here and there to the west patches of green, all that is left of the gardens of Damascus. It is invigorating. We descend, passing by an office that is surrounded by dozens of black Mercedes cars and lots of security people. I learn later that this is where the President has his office. It is a shabby building but one can, at least, walk within 20 yards of it, and the residential flats nearby in these leafy suburbs must be desirable. I have my own Damascus diaries, but they are only two entries long! In my youthful travelling days, back in 1974, I hitch-hiked from Europe to Australia, by way of the Middle East, stopping in Damascus for only two days. I was befriended by a young man named Khald, who so generously let me stay in his house, and took me around the city with his friends. ‘This morning I walk for a few hours - it’s very, very busy with numerous street sellers, and a lot of smoke. I pass by several long narrow covered streets selling mostly clothing, shoes and fancy goods, handicrafts, copper, wood - rickety overhangs balanced on bent beams provide the shade. Everywhere, there are old buildings, once beautiful, but now falling down, and much building of modern blocks too. I visit the Umayyad Mosque. This is the most beautiful place I have yet seen. As you enter through the arches of a vast courtyard, there are the most fantastic mosaics of bright colours far above, with enchanting pictures of villages. To one side, there is a vast edifice with two beautiful altars of mother of pearl in wood and very detailed wood carving. People come here for cool and rest and prayer. In the middle is the tomb of the Prophet Yehia (John the Baptist) with a velvet cloth covering. So beautiful. For S£1 I go next to the Al Azm Palace, the 18th century home of The Pasha - one of the ruling class, a typical rich man’s house - here too are many lovely things. The rooms are smallish with the most beautiful wood carvings on doors and ceilings - painted so intricately with dour colours and gold in square patterns. The courtyard is very pretty, with many green plants - but this is usual. There’s a folkloric museum here too.